Phil finally got his big orange Bronco working, and we made a quick shakedown run up Skyline Drive in the Cleveland National Forest. We had to make sure that everything was working before we hit the Mojave Road. Go here for some pics. Most will agree that Travsite.com consists of silly pictures and lame anecdotes from my life. Honestly, there is no reason for you to be looking at this web site. Nevertheless, I looked at my web statistics for 2006 and I realized that this site had over 1,000,000 page views from almost 120,000 visitors in the last year. The Internet has put the entire knowledge of this earth at our fingertips, but I have led you astray with pictures of puppies, off-roading and Wahoo's fish tacos. 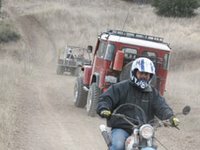 Things to do in Orange County - This list has been popular in Google, and I always get emails asking about some of the activities on it. Kind of fun. Saudi Sand Duners - I still get a kick out of this one. Old School BMX Video - Highlights from our days in the Yorba Linda lakebed. Medieval Times - dinner and tournament! Jessica Blogs! - her first blog post ever. Not likely to happen again. Marwood Block Party - I love this neighborhood. Springville, CA - Have you ever seen "Deliverance"? The Impeach Bush Van - 3,700 visits and 27 comments - this post was covered by numerous major political blogs. Still can't figure out what this guy was thinking. Hotmail Deletes Jessica's Account After 30 Days - Hotmail is the worst webmail out there. Switch to something else now. OC Bratt - wonders never cease. Del Taco Sends Me to the E.R. - I couldn't eat chicken soft tacos for months. 10 Dumbest Things at the Off-Road Expo - bling bling! Shakey's Pizza - don't click here. Here is a video of some OC journalists who just discovered off-roading in Orange County. There is also an article on today's Outdoor section in the back of the Sports page. 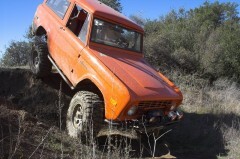 They talked about off-roading on Main Divide Road in Cleveland National Forest.